"The entire production process of mafi floors takes place in Austria. Thus, we guarantee pure natural ingredients, a sustainable management of wood resources and maximum expertise in wood processing." Where is my floor produced? mafi floors are produced exclusively in Austria - from the trunk to the plank. We manufacture our parquet in two plants, which are separated by 12km. The first plant in Steindorf processes the tree up to the slats. 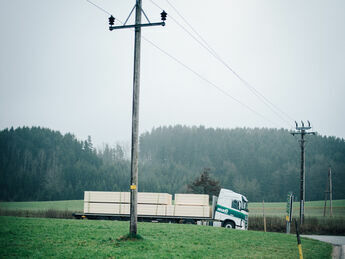 In our factory in Schneegattern, the slats are then processed into our planks. Austria has the oldest Forest Legislation in the world, century’s old know-how in the processing of wood and a tradition of the highest quality standards. For customers, it is often difficult to understand where a wooden floor came from. Is it an import from Asia? Or is it produced in a low-wage country and finished in Europe? Who can I contact if I have questions to the manufacturer? Such questions arise when the origin of the floor is unknown. Many ingredients are banned in Austria or Europe, but allowed in other countries. It is thus important for both quality and health to question where the floor comes from.